Last night I started Lesson Two of Nina’s Design Your Own Sweater Class from Knit Picks. It didn’t take long to figure out what to do at this point. I had to cast-on a LOT of stitches. Luckily, I have a very skinny husband, but one who also kind of likes baggy sweaters. The grand total came out to 240 stitches on size 6 circ needles. I knew I tried to start the sweater too late last night before I even cast-on. I had stayed at the office an extra hour to work on indexing, and my brain, it would seem, stayed there while I went home. Got home, decided cooking was not in the books last night, and sat down with my wool, brand new circ needles, and Torchwood (which is depressing me at the moment; I’m on series 3 for those familiar with the show, and I’m about to hit depressing episode 4). I swatched this time (shock! ), as I’m paranoid that the sweater won’t fit my dear husband. I decided that, to do so, I should just knit in the round with some of my spare wool (same brand and type, just different color). I used the needles I was going to use on my husband’s sweater and used Magic Loop, which is a technique I’ve never gotten the hang of. To my surprise, I was able to do Magic Loop with no difficulty at all! I’m guessing maybe it was the extra length and bendiness of the Knit Picks nickel plated needles that helped me along. Whatever caused the ease, I was very excited. Then, I cast-0n perfectly. I mean perfectly! I had the smart idea to put jump rings every 40 stitches, so the counting wasn’t so difficult and I actually hit the number right on the money. I also took my sweet time making sure the stitches didn’t twist. A twist in a cowl may be fashionable, but I don’t think my husband would appreciate it much in his sweater. I was doing so well! Then, about halfway through the first round, I realized I had been knitting with the tail and not the working yarn. I do long-tail cast-on more often than not, and this kind of thing happens quite often. Usually it’s my sign that it’s way too late in the evening to be knitting. I dutifully undid the stitches without ripping the whole thing out and set it aside. 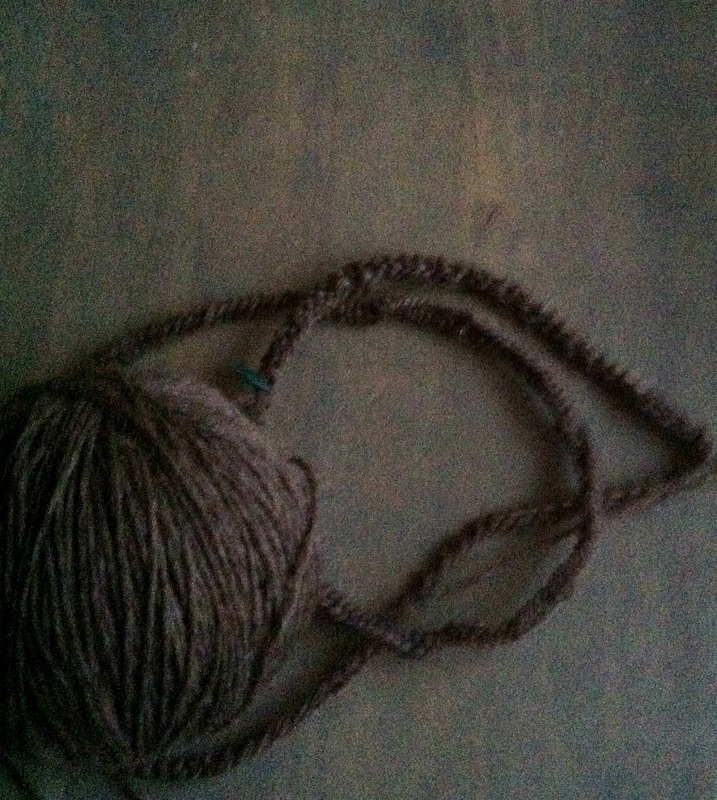 I picked it back up this morning and started off the round with the proper yarn, and things are very slowly but steadily getting started. I’m using the same ribbing that Nina uses in her tutorial, k3 p1 k1 p1. I thought it looked really unique, so not only would it not bore me while doing it, my husband would probably appreciate it as well. I’m just hoping it doesn’t look too feminine, or if it does, that he doesn’t notice. All that comes together to say Monday’s sock night did not happen. The sock loom has been neglected since it arrived last week, and the only sock yarn I have will do better on size 0 or lower rather than on the loom, so I haven’t bothered starting. Eventually I will get back into the schedule. Maybe.